Picked this goody up at a health food/natural food store about a year ago. It sat in my cabinet forever and I finally started using it about 4 months ago. I have been wanting to add a serum to my routine and want something that is packed with antioxidants, lightly moisturizing, non-irritating, and won't break me out. This is it ya'll! This smells so yummy! Just like a chewable vitamin C. Now, you readers know that I do *not* typically like scents in products as they irritate my skin and I just don't like things smelling "sweet" or anyting like that. Well, this is scented, yet it doesn't bother me. It just smells fresh and feels light. I am not sure about the "stability" of the Vit C in this product. I need to learn more about this topic in general...so, if you have any info on that please comment or link me to that info. From the Avalon Organics website (source): "Vitamin C (Magnesium Ascorbyl Phosphate) is a powerful antioxidant that boosts the skin's immune system and defends against the damaging effects of free radicals that can age skin prematurely. Vitamin C further helps protect skin from the signs of aging by naturally increasing collagen and elastin production, stimulating cellular renewal and increasing healthy circulation. For added antioxidant protection, Avalon Organics Vitamin C Skin Care is fortified with Vitamin E, Lemon Bioflavonoids, Melatonin and Organic White Tea." The packaging states that this serum will "energize your complexion with improved circulation, clarity, tone, and texture". This organic serum has 100% vegetarian ingredients and this company does no animal testing. I use this under my facial moisturizer/sunscreen in the mornings. I pump out a pea-sized amount and use it for my whole face. Now, I don't use this every day. Just when I feel like I want to "do" something a little extra for my skin. Or, when I want to add a little more moisture. When I use my Skinmedica sunscreen/moisturizer I don't use use it very often as the skinmedica is already packed with antioxidants and Vit C (so, previously, using it about 2x per week with the Skinmedica). But, now that I am using the Biore Skin Preservation line, I seem to be using the serum a bit more often (3-4X per week). I like to add the Avalon Vit C serum a few days a week to make sure I am giving my skin antioxidants. I really cannot tell you readers if the Vit C or antioxidants in this serum are helping my skin because that would be the "invisible" benefit. Antioxidants are supposed to help prevent premature aging and are supposed to help protect your skin from the harmful/aging effects of the sun. So, only time will tell with this as far as prevention...and ultimately I would never know if is the Vit C serum or my moisturizer/SPF that is making the most impact. What I do know is that this serum is a nice way to boost nutrients into your skin and to provide a little extra moisturization. My skin feels super dewy after I use this. I also believe that it has helped improve my skintone and texture. My skin looks very smooth and even-toned. I just love applying this in the morning for the fresh feel and scent of the serum. The texture of this serum is really not serum-like, but more like gel moisturizer. It sinks into your skin very quickly. I love it and will continue to use and repurchase. Ultimately, I would like to post all the items used in my skincare routine as I believe that really it is the combination of all the products that I use that are producing the good-skin results that I am experiencing. Avalon Organics are easy to find and the Vitamin C serum retails for about $20: Target, Kroger, Whole Food, and natural foods stores. 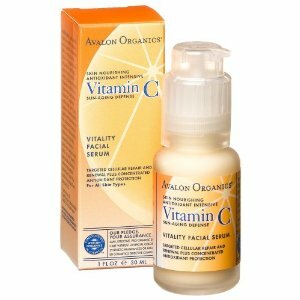 I like this serum so much that I am tempted to try more products from the Vit C line by Avalon Organics. I love that you are al over the beauty secrets. Do you have any tips for undereye circles (I inherited them- they are there in full force even on my best day)? This serum is really good! It definitely works! I always buy it at www.iherb.com. The price is cheaper than in other stores. Hi Ligia-Thanks for the code!